A 17 year old male on a Duke of Edinburgh expedition suffered a torn muscle in his groin, and was unable to continue. The Team sent a vehicle to Wythburn, with another following shortly, in order to arrange evacuation and treatment if necessary. 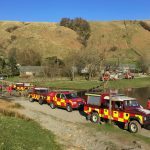 Langdale Ambleside MRT offered their assistance, but once the location had been confirmed it made sense for us to handle it. Considerable difficulties with communications were experienced, but fortunately we were able to gain the assistance of Helimed 08 from Blackpool to fly the young man off. 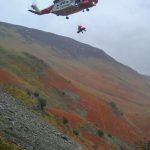 He was examined and treated by the paramedic from the Air Ambulance, and then flown to Keswick MRT base, to await collection by the group supervisor. 12 Team members – 2 hours 58 minutes.